Canadian medical cannabis companies are primed to tap what one industry executive calls “insane” growth overseas. Flush with capital and largely free from American competition, Canadian licensed producers (LPs) are spreading their wings to gain a first-mover advantage in new markets as more countries legalize marijuana for medical use. Fueling the overseas push is the vast amount of funding the companies have accumulated: During the first half of 2017, Canadian cannabis companies raised more than 1 billion Canadian dollars ($790 million), up more than 1,700% from the same period last year. “One of the big advantages that Canadian companies have internationally right now is that we have access to capital that companies in no other country can match,” said Cam Battley, a member of the board of Cannabis Canada, the industry association for licensed cannabis producers. The potential is significant. A recent analysis by Toronto-based Eight Capital, a full-service investment dealer, pegs the potential international medical cannabis market at CA$180 billion ($142 billion) over the next 15 years. “We believe the path to global expansion for the LPs starts by partnering through medical-focused opportunities, and that in the longer term, international medical markets could be major upside opportunities,” the report states. Germany and Australia have been the early focus for nearly a dozen Canadian MMJ companies tapping international markets through exports of flower and oils, licensing arrangements, distribution deals and acquisitions. Others have accumulated interests in South America. Europe, where about a dozen countries permit sales of MMJ, is the big prize. Battley said Canadian companies are going overseas to capitalize on their advantage while it exists. 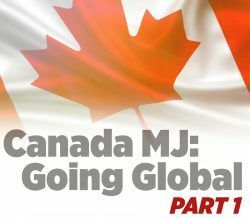 “There are no significant American competitors right now on the international stage, so the best opportunities are open to well-capitalized Canadian producers,” he said. Vahan Ajamian, an analyst in Beacon Securities’ Toronto office, said Canadian cannabis firms are driven by opportunity overseas rather than competition at home. “These are opportunities you’re looking to exploit, because of your size and capability in Canada,” he added. After Germany agreed to greatly expand its medical cannabis program earlier this year, a number of Canadian companies quickly established a foothold in Europe’s largest economy. Germany became the first country to cover the cost of medical cannabis through its national health insurance system for any therapeutic application approved by a doctor. The country is conducting an application process to select 10 licensed producers to cultivate 200 kilograms (441 pounds) of medical marijuana annually from 2019 to 2022. The 10 licensees could be announced in September, according to industry officials. Until domestic producers are operational, imports will be needed to meet German demand. Among the Canadian companies vying for one of the coveted licenses is Alberta-based Aurora Cannabis, which lists as ACB on the Toronto Stock Exchange. In May, the licensed MMJ cultivator acquired Germany-based Pedanios, an importer, exporter and distributor of medical cannabis in the European Union. It’s the largest medical cannabis distributor in Germany. Pedanios passed the first stage of the application process. Ottawa, Ontario-based ABcann Global (TSX Venture: ABCN), another licensed producer, also is pursuing opportunities in Germany, and its common shares trade on the Frankfurt Stock Exchange. CEO Aaron Keay said ABcann Global sees Germany as a gateway to broader European opportunities. Canopy Growth (TSE: WEED), a licensed producer based in Smiths Falls, Ontario, established a foothold in the country with exports to Germany and its acquisition of MedCann, a Germany-based pharmaceutical distributor, in late 2016. “There’s a lot of things that happen in the German market that are going to mirror what happens in Canada. So from a positioning perspective, and with the experience we bring to the table, we think we’re going to excel,” he said. Toronto-based Cronos Group (TSXV: MJN) took its first step overseas, through its wholly owned subsidiary Peace Naturals Project, by exporting medical marijuana to Germany. Last year, Saskatoon-based CanniMed named Australia-based Creso Pharma as its “preferred distributor” of medical cannabis products in the EU. Burlington, Ontario-based Maricann Group (Canadian Securities Exchange: MARI) established a subsidiary in Germany called Maricann GmbH, and raised $42 million to further expand production there. Nanaimo-based Tilray, which already exports to various countries, hopes to add Germany to that list this year. Harvest One Cannabis (TSX Venture: HVST) of Vancouver has a wholly-owned subsidiary in Switzerland, Satipharm AG. Australia, with a comparable population and demographic makeup to Canada, is receiving considerable interest from international cannabis companies. The country legalized medical marijuana last year for patients with chronic or painful illnesses. In May, CanniMed (TSE: CMED) marked its first shipment of commercial cannabis oil to Australia with the sale of 3,600 milliliters of oil to Health House International, a medical cannabis wholesaler in Perth. Canopy Growth wants to use the lessons it learned in its early days in Canada to help AusCann Group Holdings (Australian Securities Exchange: AC8) in Australia. Canopy Growth will offer its expertise to AusCann in exchange for an initial 15% ownership stake in the company. AusCann’s strategic partner has been granted two cannabis licenses from Australia’s Office of Drug Control. AusCann will import MMJ from Canopy until it’s capable of supplying locally produced medicine. Aurora Cannabis entered the Australian market by taking a 19.9% stake in Cann Group Limited (Australian Securities Exchange: CAN). Cann is the first Australian company licensed to conduct research on and cultivate medical cannabis. Aurora will also be exporting its intellectual property under an agreement with Cann. ABcann Global is also actively looking at opportunities in Australia, CEO Keay told Marijuana Business Daily. Canadian licensed producers have also done business in Colombia, Croatia, South Africa, New Zealand, Chile, Cyprus, Brazil, the Cayman Islands, Israel, Spain, Uruguay and the Netherlands. Do you search producers for joint ventures also? Is there an ETF yet for these industries?